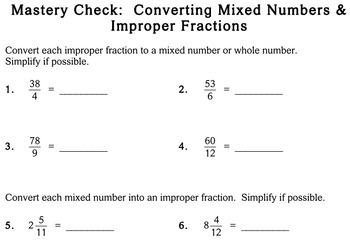 A set of 12 worksheets and a quiz on converting between improper fractions and mixed numbers, designed for fifth grade level. 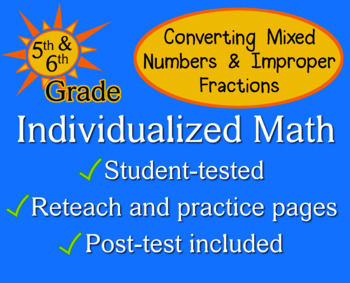 Briefly introduces the concept visually, then teaches computational methods to convert between forms. 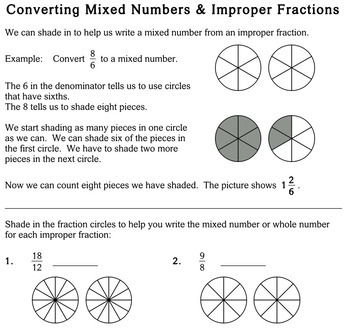 Shares some questions with the fourth grade set, but spends less time with visual models, has slightly smaller font and pictures overall, and teaches to convert mixed numbers back to improper fractions. 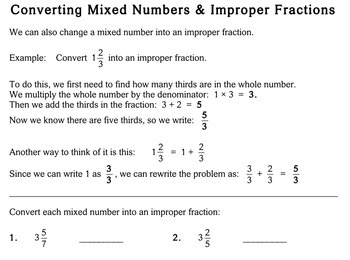 I created this to use with my tutoring students; if they're having difficulty with or haven't learned how to convert improper fractions to mixed numbers, these worksheets always give them the practice they need to become successful with the concept!